Last month, I had the opportunity to participate in an All Member Exhibit put on by the Lawrence Art Guild at the Hobbs-Taylor Lofts in Lawrence, Kansas. This was an unjuried exhibit of recent work by about 100 members of the Lawrence Art Guild, of which I am a member. There was a large variety of mediums represented in this exhibit, from photography to ceramics to oil paint to fiber. 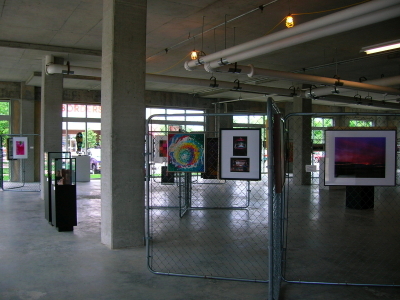 For the first time, this annual exhibit was held in a ground floor section of the recently constructed Hobbs-Taylor Lofts building. This was a large space that is awaiting the perfect business to come along and lease it, so it is only roughly finished. 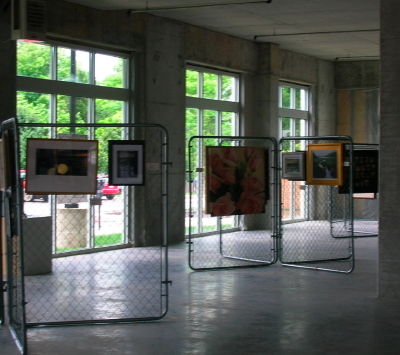 The guild used chain link fence panels set up in sections of four to show much of the work. I found that I liked the contrast between the art and the raw concrete and wire. The fence panels were reasonably lightweight to set up, and they hold up to the wear and tear of being stored and moved from site to site. My only criticism of the exhibit is that it was lacking in light. During the stormy day that I exhibit-sat, I began to wish that I had flashlights to hand out to the visitors. Fiber was represented by a number of works in this exhibit, including a Jacquard weaving by Carla Tilghman, a chenille garment by Marci Blank, a machine lace and fabric scarf by Jill Mickel Zinn and quilts by Marge Banks and Linda Frost. Mixed art exhibits of this type can be jarring, as one goes abruptly from one medium to another. Does this make one more aware of each individual art piece or is it ultimately just too distracting? I first met Ada Niedenthal in May of 2002. 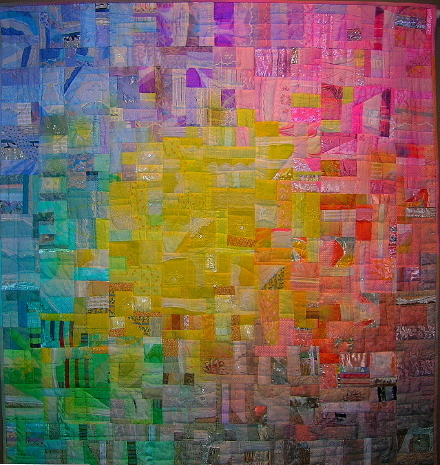 She and I hung a Special Exhibit by the Kansas Art Quilters at the Spring International Quilt Market, which was held in Kansas City that year. 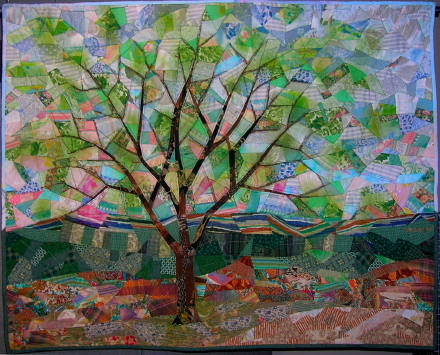 We were both members of Kansas Art Quilters, a group that had formed in 2001. I had just taken on the job of Exhibit Chair for the group, and this was my first time hanging an exhibit that was not made up of only traditional quilts. Ada was a tremendous help to me with that chore, and then stayed on with me to help hang the other special exhibits that were part of Quilt Market that year. She was so much more patient than I was as we hung and re-hung the other quilts and garments to suit the show directors in that vast un-air conditioned convention hall. We went our separate directions after the end of the show, and then slowly lost contact with each other as my communications became more email powered. Ada was a holdout against this technology. Eventually, she gave up membership in Kansas Art Quilters when the group stopped sending out printed newsletters and switched to an entirely internet-based existence. At the time, I thought that Ada was not doing herself any favors by cutting herself off from the wealth of information that was available online and from the chat groups. Now I think I might have been very wrong. Ada’s show contained over thirty textile art quilts that had an average size of about 30 by 40 inches. I have seen the average size of my own work diminish to Artists’ Trading Card size as I have watched my time spent online increase, so I found this aspect of her show impressive by itself. But more importantly, Ada has her own strong voice in all of her work. 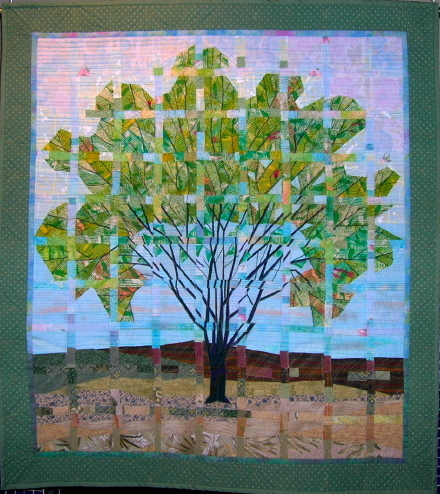 Her background in landscape design is evident in her work that depicts trees, such as “First Tree” and “Fractured Elm”. 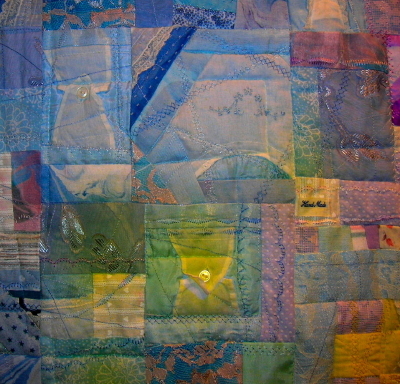 She uses color effectively in work such as “Diminutive Details” where the work pulls the viewer in closer to see how she has used pieces of baby clothing and vintage garments to carefully construct the quilt. Ada’s art is in response to her life and the events around her. Most recently, she has incorporated her thoughts and feelings about the Bush administration into her art, so I do not want to portray her as cut off from the world. I was inspired by Ada’s exhibit, and I now can see that the life spent with less computer time has a lot to offer. Ada has recently gotten an email address, so I can only hope she will not be as consumed by the Internet as I have become. I wonder if I would have been better off in my artistic endeavors if I had held out longer against the allure of the World Wide Web? Even as I delete memberships to chat groups, I have been adding subscriptions to blogs…. Is there really any net gain to all of this added “net” information? 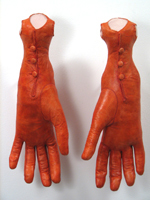 Claire Watson’s unusual glove sculptures were on view at Art Sites gallery in Riverhead, NY during my recent visit to Long Island. Taking advantage of the opportunity to see unusual textile based work by an artist unfamiliar to me, I took time out from beachcombing to visit this exhibit. Watson’s art is formed from ladies gloves that are taken apart and then reconstructed and altered. Doll parts and doll-making techniques are incorporated along with additional seams to form lines and shapes that change the original glove into an entirely new creature. The resulting forms are stuffed with sawdust and presented as discrete (and often unsettling) objects. In making these sculptures, Watson hopes to suggest flesh (and its fragility), preoccupations with its containment or disclosure, and escape through role-playing and costume. She says she thinks of women’s traditions of handwork and long hours spent in sewing while she is working on these pieces, and also is reminded of dolls and toys. The artist has said that the shape of each sculpture comes from the gloves themselves- the extent to which they were deconstructed and then rebuilt evolved as the piece developed. In some cases, Watson made the gloves from sewing patterns. Other times, they came from the collection of gloves that she has accumulated. I was quite fascinated by these sculptures, as each piece seemed to fool the eye as it traveled along the piece. There were legs that morphed into a hand, or fingers that attach to a doll’s head instead of a hand. Some pieces invited longer study, to discover clever construction. My favorite work of the exhibit was a piece that had gloves where each finger ended in its own tiny-gloved hand. Also on display at this gallery was Claire Watson’s most recent work called “Familiars”. The sculptures in this exhibit begin with kitchen and household tools that have been transformed with polymer clay. These pieces start with sock darning eggs, wooden rolling pins, wooden spoons and mallets. These items were selected both because they are made to be grasped or touched by the human hand, and also because their shapes suggest parts of the human form. The polymer clay that encases these wooden objects is flesh colored doll-makers clay which gives each piece the appearance of human flesh. The sculptures’ shapes have only a vague suggestion of human form or human body part. The abstraction of each piece is intentional, according to the artist, as she hopes the work will not suggest an exact form or use for the underlying tool, but instead will suggest mystery of functions that are no longer part of our common knowledge. Claire Watson, a resident of Water Mill, received a BFA from the University of Texas at Austin, and an MFA from Tyler School of Art at Temple University in Rome and Philadelphia. She received a Pollock-Krasner Foundation Grant in 1990-1991, and is a 2007 Fellow in Sculpture from the New York Foundation for the Arts. There is no limit to the number of worthy and deserving causes that one can support. I am certain that business owners are constantly being asked to donate goods and services. But I also feel that visual artists must be a close second to businesses in the frequency of requests for donations of their art. Textile artists in particular seem to be targeted, perhaps due to the long history of raffle quilts. Is there anyone out there with “quilter” by their name that isn’t constantly approached for donations to silent auctions, live auctions, and raffle drawings? To my prejudiced eye, musical artists are rarely involved in these events. Theater and dance artistry are also scarce. Producing art that can be displayed and then held up for sale seems to make it so much more desirable for donation. In my previous article, I touched on the subject of geometric art created by women. I had wondered if the repetitive skills of homemaking inspired a love of repetitive mark making by women in cooperative primitive situations as well as in busy modern life. In contrast, I’d like to now look at the work of three male artists created in solitude by minds that might be considered beyond the norm.